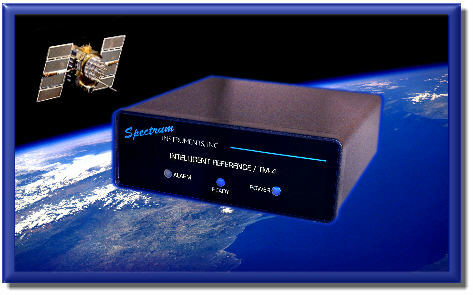 Welcome to Spectrum Instruments - leaders in high-performance GPS disciplined precise time and frequency references! Spectrum Instruments specializes in high-performance, GPS disciplined precise timing, synchronization, frequency reference and signal distribution equipment, designed to exceed expectations for performance, reliability and cost. The strength of Spectrum's core technologies is the flexibility to allow for modification and customization to meet application-specific needs. Particular specialties include phase coherency, low phase noise, high timing accuracy, jitterless PPS, holdover stability and low power applications. The Intelligent Reference/TM-4™ 10 MHz OCXO based platform represents Spectrum's fourth-generation architecture and is the foundation for all current off-the-shelf instruments and custom designs. Spectrum regularly cooperates with the initial small volume, proof-of-concept, prototyping and first-article requirements of engineers and system integrators in the early stages of developing new products that require GPS based timing or frequency references. Customer-specific modifications usually do not require any minimum quantity or commitments. Extraordinary service is Spectrum's passion. Our evaluation program, demonstration units, easy return policy and extended warranty period all combine to minimize or eliminate any risk that a new customer might perceive with regard to performance or compatibility. Our resulting devoted customer base is testimony to Spectrum's success in providing optimum solutions for specific timing, synchronization, frequency reference and signal distribution products. All sales (other than for Asia) are made directly through our headquarters office in San Dimas, California. Sales to Aisa, Taiwan and China are made though our affiliate office in Taiwan. Please contact us for off-the-shelf pricing or to discuss any unique requirements. Copyright ©2007, Spectrum Instruments, Inc. All Rights Reserved.